The Bharatiya Janata Party (BJP) in Tamil Nadu is flustered by scenes in a movie criticising several policies introduced by its government at the Centre led by Prime Minister Narendra Modi. All hell broke loose over the release of Mersal, a drama featuring popular actor Vijay, for Diwali. Already a major hit with the masses, the movie deals with corruption in the medical profession, among other themes of social justice. On Wednesday, BJP’s Tamil Nadu president Tamilisai Soundararajan demanded several scenes from the film to be excised because they criticised Prime Minister Narendra Modi and a number of policies implemented by his administration. One of the offending bits is in this snippet from Mersal, with English subtitles, posted by a Twitter user. The speech made by the character played by Vijay highlights the Modi government’s mismanagement of the infamous move to demonetise high-value currency in November 2016. Another actor in Mersal shows off his empty wallet to prove that Modi government’s financial sleight of hand has forced him to go cashless. Before the public had fully recovered from the aftermath of the noteban, the Goods and Services Tax (GST) and its shoddy imposition unleashed a fresh round of havoc to the economy, especially small- and medium-size businesses. Add to the economic woes, the general mishandling of healthcare, exemplified by the scores of children who allegedly died due to lack of oxygen supply in Gorakhpur, Uttar Pradesh, in August this year. 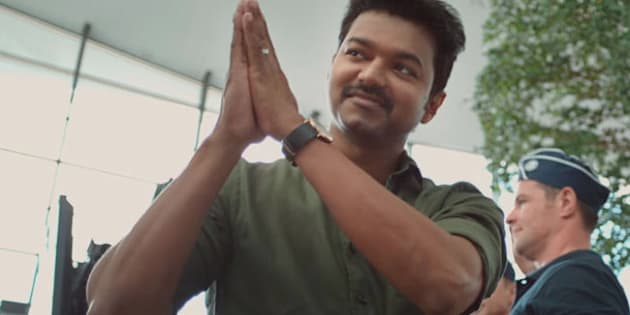 The character played by Vijay not only highlights these damages wreaked by the government at the Centre but also compares similar policies in places like Singapore, which have, he claims, applied such strategies with more success. Matters went downhill from there. On Friday BJP national secretary H Raja attacked Vijay on Twitter, saying that his lines in Mersal exposed the actor’s ignorance on economic matters. But that wasn’t all. He decided to drag in the actor’s religion, by dredging up his Christian name, Joseph, which he scarcely uses. All this to put an ugly communal angle to the alleged slurs a character played by him makes in a movie. Raja also said he was “trying to confirm” whether the producer Hema Rukmani of Thenandal Studios Ltd “may also be a Christian”. In 2014, Modi had met Vijay while campaigning for the general elections, which propelled him to power by a landslide victory, and sought to seek the support of his fan base for the polls. Vijay is followed by over 3 million people on Twitter and is revered as a superstar. In 2015, Vijay faced raids on suspicions of tax evasion, which Raja also brought into his counter-attack. He also pointed out that the claims made about Singapore’s healthcare and public policies in the movie by the actor are incorrect. Be that as it may, the government has no business asking for cuts from a movie after it has been cleared for release, simply because the latter is critical of its performance. Such a demand exposes the BJP’s lack of respect to the principle of freedom of expression enshrined in the Constitution and guaranteed to every citizen. Worse still, it reveals the depths of insecurity in the rank and file of the party that it is compelled to behave like an autocratic at the slightest hint of disagreement. As of now, titans of Tamil cinema, such as Pa Ranjith, who directed Rajinikanth’s Kabali, are supporting Vijay, as are the fans of his rival superstar Ajith. Actor Kamal Haasan also tweeted his support to Mersal and Vijay. “Don’t silence critics. India will shine when it speaks. Mersal was certified. Don’t re-censor it. Counter criticism with logical response,” he said. The overwhelming reaction to Mersal from the public so far also perhaps shows that, like any successful cinema, it has been able to appeal to the people’s sentiment by speaking of their grievances and for them. As for the BJP, its desperation to get a toe-hold in the southern states will not be favourably served by its penchant for banning, if the earlier attempt to ban beef consumption in Kerala is any indication.